The long-awaited biography of Doreen Valiente by Philip Heselton will be launched at Treadwell's Bookshop, in London, on Friday, February 21, with a morning of talks followed by an afternoon party. 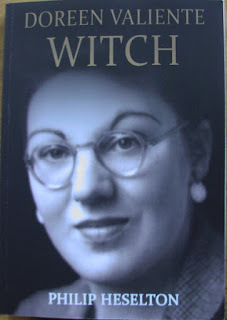 The book is called Doreen Valiente: Witch and includes lots of information about Gerald Gardner's most famous High Priestess, the Mother of Modern Wicca. From noon to 2pm, Philip Heselton, John Belham-Payne and Ashley Mortimer will share information about Doreen’s magical approach, magical artefacts and activities during the Second World War. The session ends with a rarely seen 20-minute film called The Life and Times of Doreen, featuring the last footage of her ever taken. Ticket holders for the earlier talks are automatically invited to the launch party. If you just want to attend the party it is free, but you need to reserve a place in advance by emailling info@treadwells-london.com. Copies of Doreen Valiente: Witch will be available to by at Treadwell's, 33 Store Street Bloomsbury, London WC1E 7BS on the day. I am currently reading an advance copy of the book and will post a review of it at the time of the launch. I'm not allowed to give any spoilers as there is a strict embargo, but I can tell you it is very good indeed.